THE FUTURE OF OUR CHURCH IS IN THE FAITH OF OUR YOUTH. 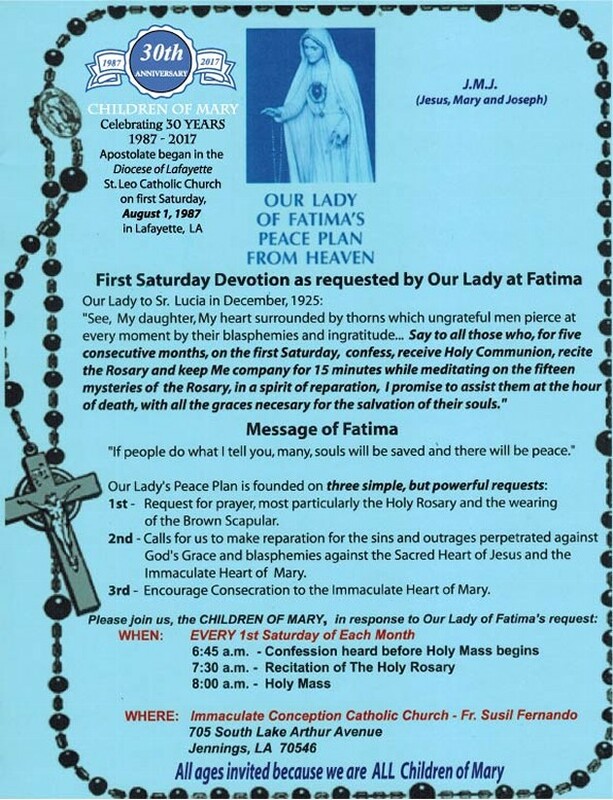 IN 2017, THE CHILDREN OF MARY APOSTOLATE, A FIRST SATURDAY DEVOTION AS REQUESTED BY OUR LADY OF FATIMA IN 1917, IS CELEBRATING ITS 30TH YEAR OF EXISTENCE DURING THIS 100TH YEAR CELEBRATION OF OUR LADY'S APPEARANCES AT FATIMA! THE APOSTOLATE BEGAN IN THE DIOCESE OF LAFAYETTE, ON FIRST SATURDAY, AUGUST 1, 1987, AT ST. LEO CATHOLIC CHURCH IN LAFAYETTE, LA. IN 1991, BISHOP HARRY FLYNN BLESSED THE APOSTOLATE BY ACCEPTING AN INVITATION TO ATTEND A FIRST SATURDAY MASS AND IN 1998 UNDER THE DIRECTION OF FR. WILLIAM BLANDA AND FR. JAY VOORHIES, THE CHILDREN OF MARY WAS PLACED ON A DIOCESAN LEVEL IN THE DIOCESE OF LAFAYETTE UNDER THE CATEGORIES OF EDUCATION AND FORMATION. THIS APOSTOLATE HAS SPREAD TO AT LEAST 15 CHURCH PARISHES ACROSS LOUISIANA. THE APOSTOLATE IS LOOKING TO SPREAD TO EVEN MORE PARISHES. TO FIND OUT INFORMATION ABOUT BRINGING THIS APOSTOLATE TO YOUR PARISH , PLEASE CONTACT: MICHELLE GUIDRY AT 337-654-1003. 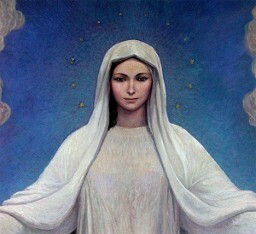 ALL AGES INVITED - WE ARE ALL CHILDREN OF MARY.